It’s December 1968 and Judy Garland is about to make her comeback….again. In a London hotel room, with both her new young fiancé and her adoring accompanist, Garland struggles to get “beyond the rainbow” with her signature cocktail of talent, tenacity and razor-sharp wit. Featuring some of Garland’s most memorable songs, this savagely funny play with music offers unique insight into the inner conflict that inspired and consumed one of the most beloved figures in American history. Angela Ingersoll returns to Porchlight where she last appeared in The Secret Garden. Currently appearing in How to Succeed in Business Without Really Trying at Marriott Theatre, other credits include: The Great Gatsby (Indiana Repertory Theatre); Shakespeare’s Greatest Hits, The Merry Wives of Windsor, Richard III, The Comedy of Errors (Chicago Shakespeare Theater); The Game’s Afoot, The 39 Steps (Drury Lane Theatre); The Mistress Cycle (Apple Tree/Auditorium); Carousel (Madison Rep); South Pacific (Light Opera Works); Disney’s Beauty and the Beast, Man of La Mancha, Macbeth, Jekyll and Hyde, Ragtime, Nine, The Philadelphia Story, The Wizard of Oz (Playhouse on the Square). Comedy: Second City Hollywood. TV: “Chicago PD.” Ingersoll and husband Michael Ingersoll produce the Artists Lounge Live concert series. Concerts: I Gotta Right to Sing the Blues (Paramount Theatre, etc); My Baby Just Cares for Me (Northlight Theatre, etc,) and The 12 Dames of Christmas. She’s the recipient of two Jeff Award Nominations, two Ostrander Award Nominations and four Ostrander Awards. Kyle Hatley is making his Porchlight debut. He is an actor, director and writer. Hatley was born and raised in Memphis, TN and relocated to Chicago after graduating from Rhodes College. His television credits include a guest starring role on NBC’s “Chicago Fire” and co-starring in FOX’s “Prison Break” and CBS’s “As The World Turns.” He is a 2011 Charlotte Street Foundation Generative Artist Fellow and served as associate artistic director of Kansas City Repertory Theatre from 2008 until 2014, where he directed, performed and produced six seasons alongside Artistic Director Eric Rosen and Producing Director Jerry Genochio. After joining his wife in Chicago in August of 2014, he served as resident director for the 50th Anniversary Season at Kansas City Repertory Theatre, and remains a board member and artistic associate of The Living Room Theatre. In the last seven years he has worked primarily in Kansas City, Missouri at KC Rep, The Living Room Theatre, The Heart of America Shakespeare Festival and KC Fringe. In Chicago he has worked on Take Me Out (Steppenwolf Theatre), Execution of Justice (About Face Theatre), The Last Supper (InFusion Theatre), Picasso at the Lapine Agile (Noble Fool Theatricals), and Danny Casolaro Died for Your Sins (TimeLine Theatre Company) and, recently, The Iliad (Geva Theatre Center). 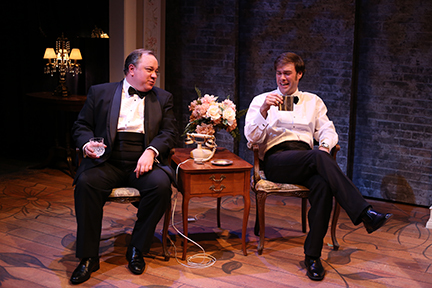 Jon Steinhagen returns to Porchlight where he last music directed the Porchlight Revisits production of Fade Out – Fade In and where his critically acclaimed musical The Teapot Scandals made its world premiere. Last seen starring as “Artie” in The House of Blue Leaves at Raven Theatre, this prolific Chicago actor and playwright has appeared in Dividing the Estate, The Odd Couple and Cat on a Hot Tin Roof (Raven Theatre),1776, Six Degrees of Separation, The Real Inspector Hound, and ACES (Signal Ensemble); Mack & Mabel, Sweet Smell of Success, and The Mystery of Edwin Drood (Circle Theatre). 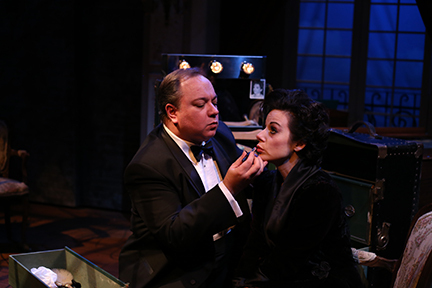 Steinhagen is also a resident playwright at Chicago Dramatists, a past winner of the Julie Harris Playwriting Award, a finalist for the first Noël Coward Award and a member of the Dramatists Guild, He has received four Jeff Awards and six nominations (AEA and non-AEA). Felipe Jorge makes his Porchlight debut with this production. Recent credits include Parachute Men (Teatro Vista), The Lieutenant of Inishmore, The Importance of Being Earnest and Cruel Intentions (White Mask Theatre Club), War of the Worlds (Gorilla Tango Theatre) and Spring Awakening (Teatro-Escola Celia Helena). Peter Quilter’s plays have been performed in major theatres in cities across six continents, including London, Cape Town, Rome, Prague, Warsaw, Amsterdam, Rio de Janeiro, Toronto, Chicago, Madrid, Sydney and New York and translated into 27 languages. He is best known for his Broadway play End of the Rainbow and his West End comedy Glorious!. He has twice been nominated for the Olivier Award (Best New Comedy 2006 and Best New Play 2011) and his Broadway debut was nominated for three Tony Awards. Artistic director of Porchlight Music Theatre, Weber previously served as artistic director for the inaugural season of Drury Lane Theatre Water Tower Place (now The Broadway Playhouse) and at Theatre at the Center (1998-2004). His productions of Side Show, Sweeney Todd, A Funny Thing Happened on the Way to the Forum, Pal Joey and Assassins at Porchlight Music Theatre, Grand Hotel at Drury Lane Theatre Water Tower Place and She Loves Me at Theatre at the Center were each nominated for the Joseph Jefferson Award for Best Production-Musical. 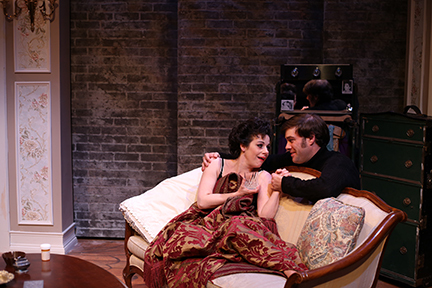 Most recently he directed Side Show (2016 Jeff Award-nomination) and Chess for Porchlight. Directing credits include Living the History-125 Years of The Auditorium Theatre starring Patti LuPone, John Mahoney and stars of Lyric Opera of Chicago, The Joffrey Ballet, Alvin Ailey American Dance Theater and more, Fifth of July and Talley’s Folly at the Oak Park Festival Theatre, The Petrified Forest at Theatre at the Center, Beauty and the Beast at Marriott Theatre, Over the River and Through the Woods at The Mercury Theater, A Funny Thing Happened on the Way to the Forum at Pheasant Run Theatre, and Cirque du Symphony at Sears Center Arena. The recipient of two Joseph Jefferson Awards, he has written and directed the past nine Equity Joseph Jefferson Awards ceremonies. Weber is proud to serve as a pledge host on WTTW, Channel 11, and he is author of the play, WAR of the WELLES. Garland is here performed by Angela Ingersoll. It is a simply magnificent portrayal, especially vocally, which is really what matters the most. It will, I think, be enough to make this show a huge hit as we go into the holiday season and, by rights, it should transform Ingersoll’s career in this town. I just found this to be a remarkably profound dive into this very familiar character — at once honest, earnest, vulnerable and live. That last adjective is the one that matters most. This did not come easy to Ingersoll. Playing someone who was more off than on takes enormous work and a rich reservoir of interpretative talent. What a performance! The extraordinary Angela Ingersoll (Judy) embodies the iconic legend. Ingersoll steps into the spotlight and belts out a song. Ingersoll plays this role with raw intensity. She visits rock bottom multiple times. She rants. She spirals. She exposes a vulnerability from career substance abuse that started as a child. Ingersoll forces us to experience the real woman behind Dorothy. Her emotional delivery is riveting and exhausting. Still, she continually transforms into the powerhouse singer and even comes back with an encore. This is a powerful tribute to an incredible singer with razor-sharp wit that couldn’t shake her addictions to drugs, booze and fame. Ingersoll’s portrayal of Judy Garland is astonishing. This show already had its final extension before it even opened. It is a must see! 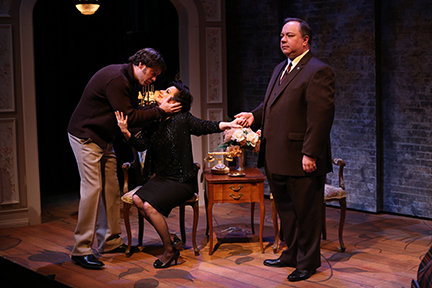 Leave it to Michael Weber to bring the Chicago Premiere of Peter Quilter’s “End Of The Rainbow” to the intimacy of Porchlight Music Theatre. WOW! The amazing Angela Ingersoll bringing Judy Garland to life. When I say Amazing, I mean AMAZING!!! She looks like her (circa 1968), she sounds like her, and I would have to say almost made me feel that I had gone back in time and was a fly on the wall of the London hotel where Ms. Garland stayed. WOW! and double Wow! When we get to the final number, “Over The Rainbow”, one can see the tears fall down her cheek and don’t be surprised to find that you are seeing her tears, through yours! Yes, I suggest a few tissues in your pocket or purse. You will need them. If you are a Garland fan, I suggest you find a way to see this masterpiece. 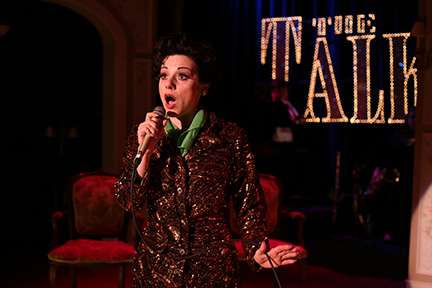 Legendary Judy Garland comes to life in stunning performance by Angela Ingersoll. Angela Ingersoll’s tour de force performance is one of the most powerful and compelling performances seen on a Chicago stage in years! With terrific arrangement by Jon Steinhagen (who also doubles on the piano) the six piece combo deftly accompany Ingersoll as she nails the Garland songbook. This bittersweet show is a must see on several levels. 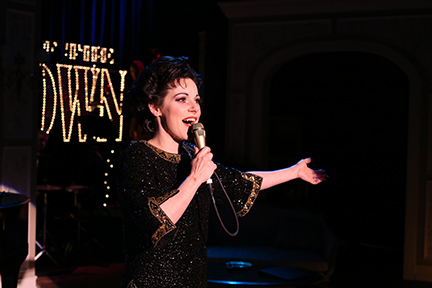 Judy Garland, played to perfection by Chicago musical theatre actress Angela Ingersoll … This actress, who’s an absolute force of nature, sinks her teeth into this role from the start and never lets go until the end. Ingersoll … is perfection in director Michael Weber’s fresh, forceful production. In addition to Michael Weber’s driving, yet sensitive direction, the production is also the work of many behind-the-scene artists, as well. 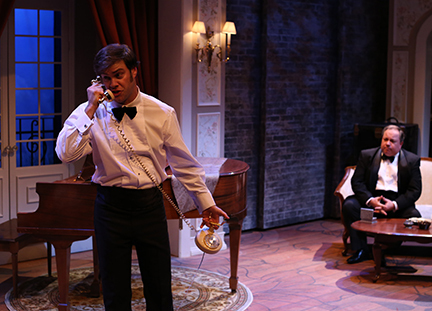 The play is tempered by Jon Steinhagen’s excellent musical direction and piano accompaniment. He’s enhanced by a terrific five-piece combo that magically appears out of nowhere. Historical authenticity is provided by Ross Hoppe’s newsreel projections, while costume designer Bill Morey shows why he’s a multi Jeff Award-winner, with his array of authentic, elegant, glitzy 1960’s fashions. Moved to tears, they may feel they’ve just been been transported back to 1968 and witnessed firsthand the sadly tragic final days of a true American legend. 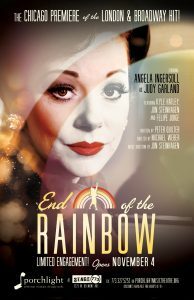 Judy Garland has been reborn: Angela Ingersoll is phenomenal in “Over the Rainbow” at Porchlight Music Theatre. A truly astonishing, tour de force performance.